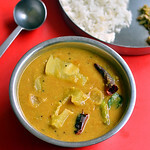 Last year I wanted to start my mango recipes with this yummy raw mango sambar / mangai sambar. But I couldn’t. This year at least let this sambar be my first mango recipe as its my most favorite. I learnt this recipe from my MIL. My mom & MIL never fails to make this sambar during mango season.We call it as “Mangai sambar” in Tamil. My Mom makes mango sambar along with drumstick. So its more like drumstick mango sambar. Her recipe is a Tirunelveli based version. I will try to make a separate post for that. This is my MIL’s version which is very easy to make without any grinding job. Its like my basic onion sambar recipe but there are slight variations in the quantity of tamarind and spices as we use sour raw mango here. Whenever my MIL make this sambar, she reserves 2 big mango pieces for me as I love to eat those soft,spicy and juicy cooked mangoes the most. When I was making this sambar, all these nostalgic memories were running behind my mind :)..Ok. 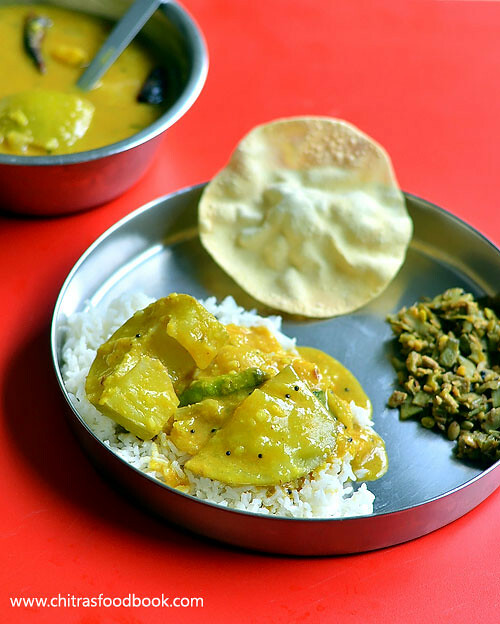 Lets see how to prepare this yummy raw mango sambar recipe with step by step pictures ! In a pressure cooker base, take the toor dal, turmeric powder,water, hing and few drops of cooking oil. Pressure cook in low flame for one whistle. Open the cooker after the steam is released and mash the dal well.Wash and cut the mango into two vertical pieces.Remove the seed in the center. Cut the mango into big pieces as shown in the picture. In a kadai, heat oil and splutter methi seeds, mustard seeds,red chilli and curry leaves. Add onions and green chilli. Saute until onion turns transparent. Add the tamarind extract, salt, turmeric powder,sambar powder,hing and few raw curry leaves. Let the tamarind extract boil for sometime. Now add the raw mango pieces and 1/2 cup of water. Let the mango pieces cook well in tamarind extract.It takes 7-8 minutes to cook well. Stay nearby and keep an eye on the mango pieces. Usually raw mango pieces cook quickly. Take a piece in a ladle and touch the flesh part. If its soft, mango is cooked well. Mango should retain its shape.Make sure its not mushy. Now add the boiled and mashed dal. Mix well and give a roll boil.Switch off the flame and garnish with coriander leaves.Serve hot with rice adding few drops of ghee! Enjoy ! Adjust the quantity of tamarind and sambar powder according to the sourness of mango. 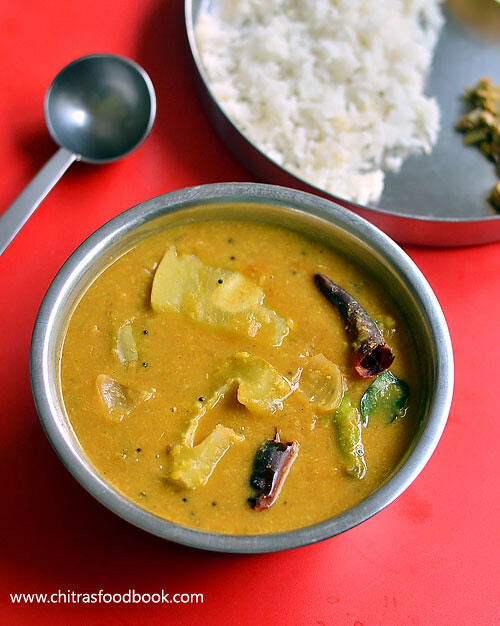 You can also use toor dal & moong dal in equal quantity to make this sambar. If you feel the mango is over cooked, remove the pieces after the sambar is done. Add the pieces just before serving so that mango will retain its shape while serving. 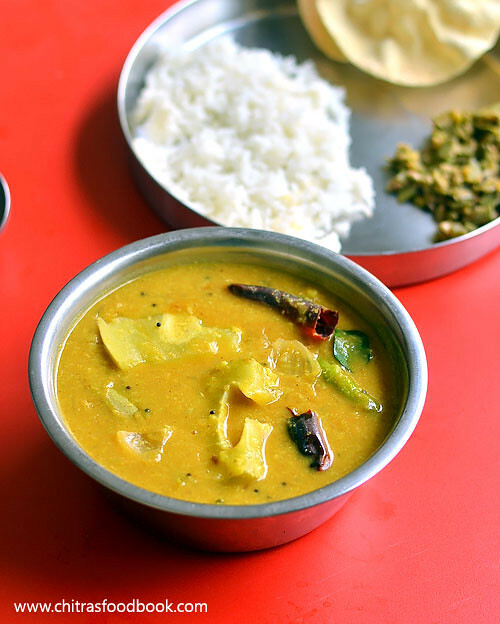 Enjoy this yummy mango sambar for your lunch ! I had with rice & broad beans poriyal.